When i look around server, i always meet item that overpowered and not supported to complex plugin like mythicmob and skillapi, and the looks of all item is same that makes boring. So, i made this plugin for the solution. This plugin have auto damage calculation in config and can change the view up to you. Because pure vanilla potion, stats, and effect is too flat. 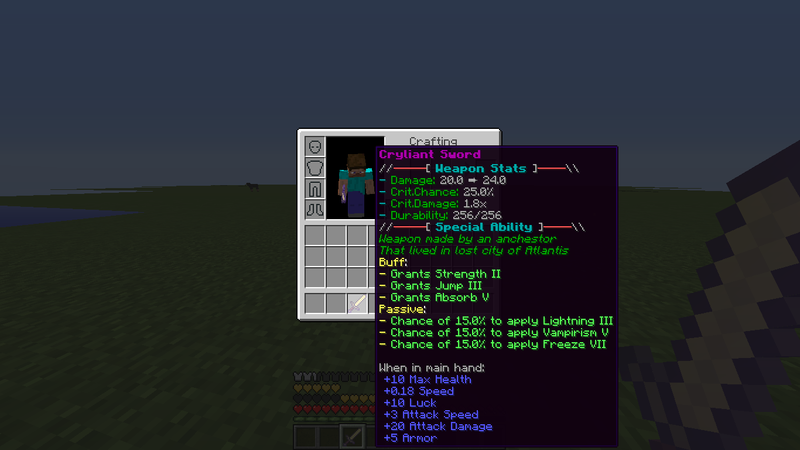 i change the main data configuration so all effect of stats from vanilla is better when using this plugin. I also add custom stats like "Freeze, Curse, and Roots"
If you like this plugin you can donate so i will make the update much faster. Send me a message if you found any bug, or want to give me a suggestion. Does this plugin add its own attributes, enchants and buffs? or do we have to use plugins like item lroe stats and rpgitems?